Accessories: Accompanied by Patek Philippe Certificate of Origin and Attestation dated January 15, 2011, additional numbered caseback, product literature, fitted presentation box engraved "250th Anniversary" and outer packaging. Fresh to the auction market, the present watch cased in yellow gold was produced as a limited edition series of 50 watches in celebration of Beyer Chronométrie's 250th anniversary. It not only displays a tachymeter scale, but also features the storied retailer's signature at 6 o'clock. So exclusive was this limited edition, that Patek Philippe created a special engraved caseback and presentation box in honor of the retailer's anniversary. Few retailers have a special relationship with Patek Philippe like Beyer has, and it is an incredible privilege for a retailer to have their name stamped on a Patek Philippe dial. 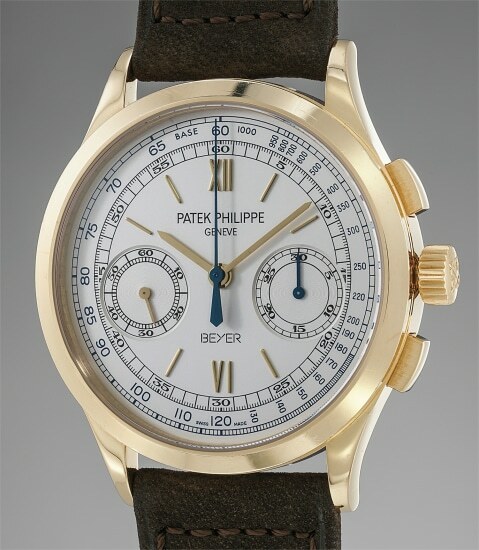 Preserved in excellent condition, the present watch is complete with its original certificate, additional caseback bearing "Patek Philippe No 35/50 Fabriquée pour le 250ème de Beyer à Zürich 1760 - 2010" and Patek Philippe box with a special engraving. To date, this is the fourth reference 5170 made in celebration of Beyer Chronometrie to surface at public auction, attesting to the rarity of the present timepiece.